Liam Buckley has also added Owen Garvan and Killian Brennan to his ranks in the last week. Balk in action for Pat's during Wednesday's friendly against Hearts. 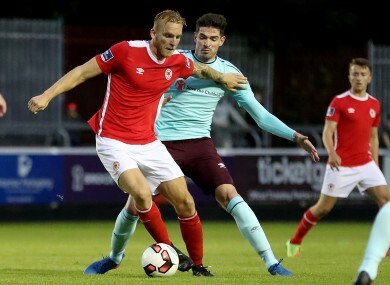 ST PATRICK’S ATHLETIC have made their third signing of the summer transfer window following the arrival of Dutch defender Jordi Balk. The 23-year-old joins the League of Ireland club after spending three years with Dutch second division outfit FC Oss. Balk was in the stands to watch Liam Buckley’s side draw 1-1 with Galway United last week and featured during the Saints’ friendly win over Hearts on Wednesday evening. The centre back came through the youth ranks at Utrecht before moving to Scotland in August 2014 where he spent four months with Ross County. Balk’s arrival at Richmond Park follows Buckley’s recruitment of Killian Brennan and former Ipswich and Crystal Palace midfielder Owen Garvan, while Pat Cregg has left the club. Pat’s currently sit 10th in the SSE Airtricity League Premier Division and travel to Turner’s Cross to face league leaders Cork City on Sunday. Email “St Pat's strengthen their squad further with signing of young Dutch defender ”. Feedback on “St Pat's strengthen their squad further with signing of young Dutch defender ”.